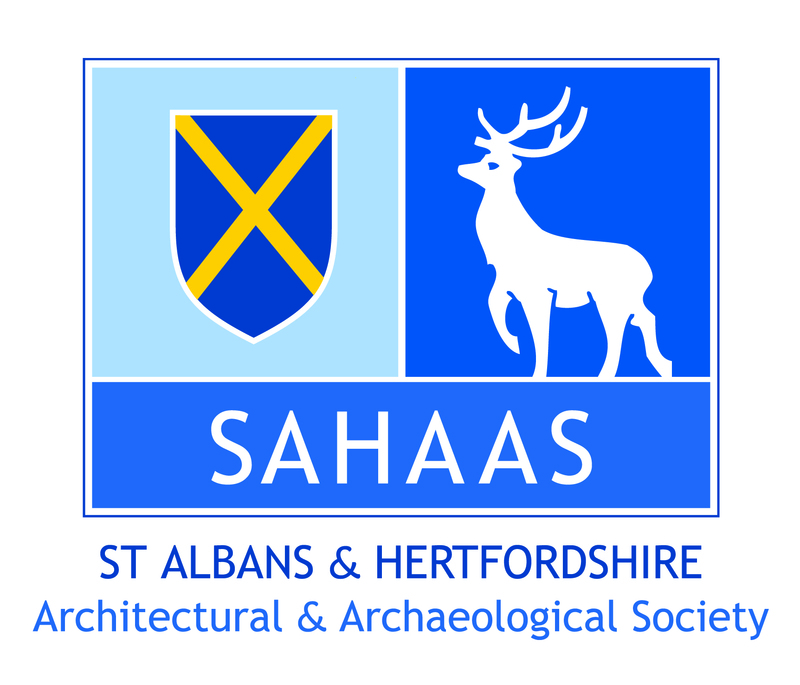 An adventure in Hertfordshire archaeology. Anyone new to this blog or geophysics in archaeology is recommended to read the material on the “Geophysical survey in archaeology” page. As I start this entry of the blog, the rain is splashing against my windows as was predicted by the Met Office. Although we might question Dolly Parton’s grammar, the sentiment seems true enough. Yesterday, however, was a superb day with all three techniques collecting data across the site. After yesterday’s excellent results, the GPR crew had great expectations. The only problem was a tree in the way under which the shepherdess had put hay when the grass in the field was dead from lack of rain. Unfortunately, sheep mean sheep droppings (Figures 1 and 2). Figure 1: Mike on sheep poo removal duty. Figure 2: Check out those wheels! Luckily for everyone concerned, I think the effort was worth it (see Figure 3)! Figure 3: GPR time slices from Day 18. 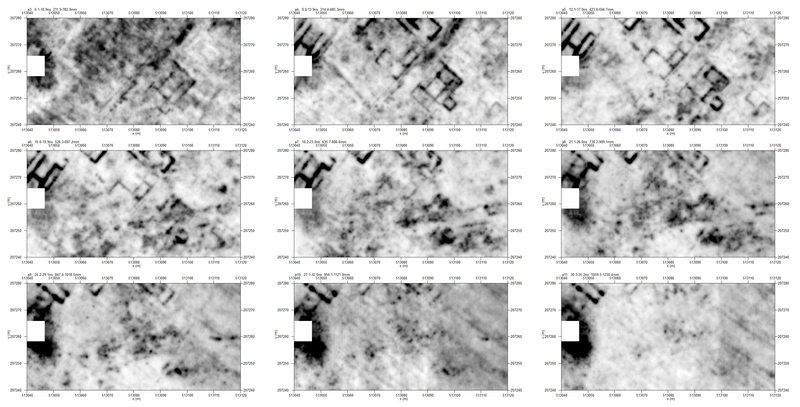 I could misquote Dolly along the lines of putting-up with sheep poo if you want excellent GPR results but I might be pushing my luck… The many buildings are quite obvious in this data set. Figure 4 shows this grid in context of the other GPR grids in this area. Figure 4: GPR results including the day 18 data (SW corner). We have added a very large number of new buildings to the map of Verulamium. As I was only just starting with GPR data when we started collecting it in 2015, the processing keeps changing a bit from block to block. 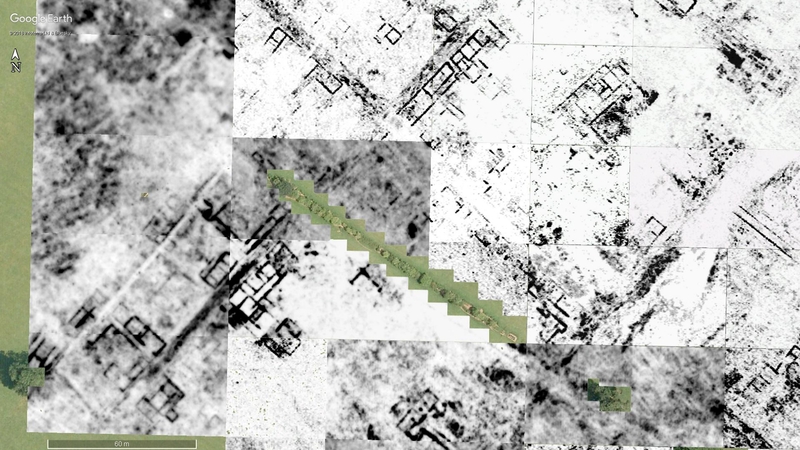 One of my jobs is to start from scratch and reprocess the whole thing so that the maps are consistent. Should keep me busy for a while. 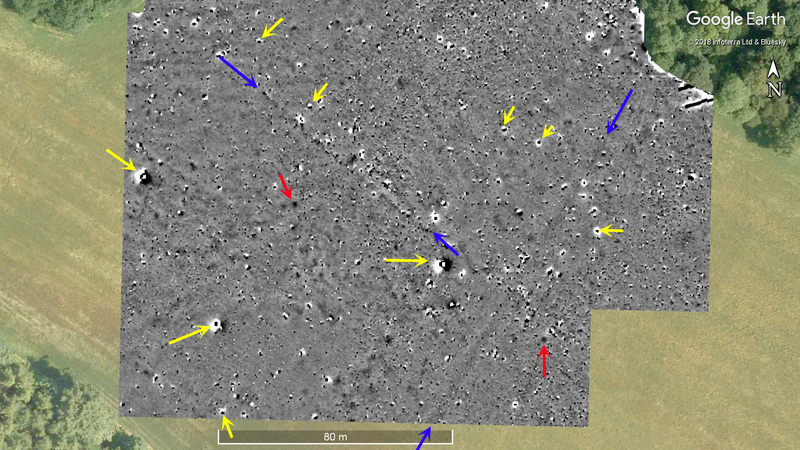 Figure 5 is a crude mosaic of images just showing the entire area surveyed so far. Figure 5: crude mosaic of GPR time slices at the end of the 2018 season. 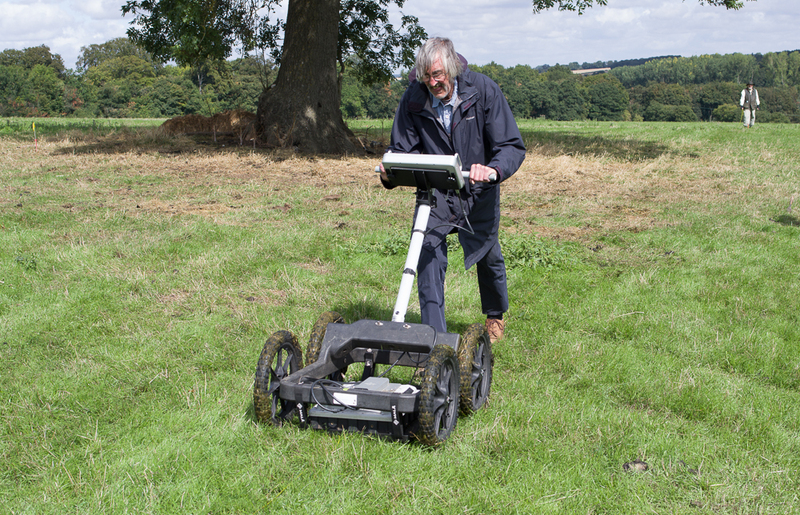 This represents 19ha of GPR data collected at 0.5m transect intervals. Just pushing the machine along the lines, not including getting to the block, setting-up, moving strings etc. is 380km. It also means 380km of radargrams! No wonder the data takes-up 33gb of my hard disk and consists of over 70,000 files. 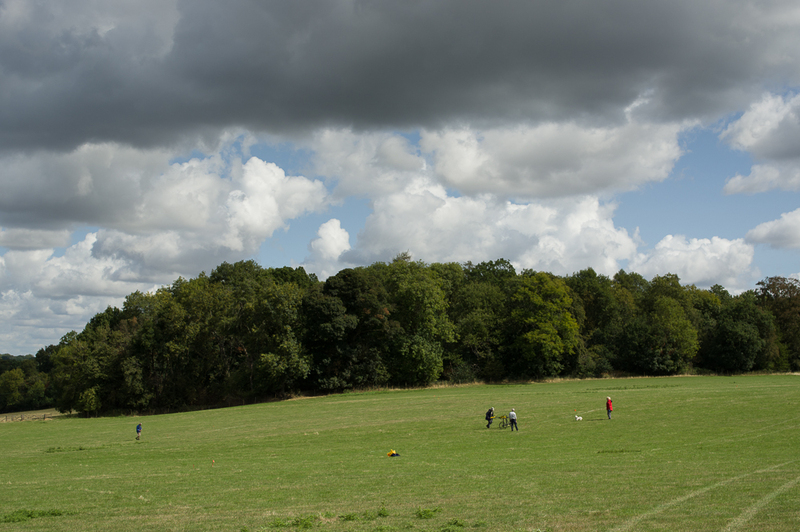 The mag team completed nine 40x40m grid squares which is 1.44 hectares. Excellent progress! Figure 6: the mag team in the southern field. 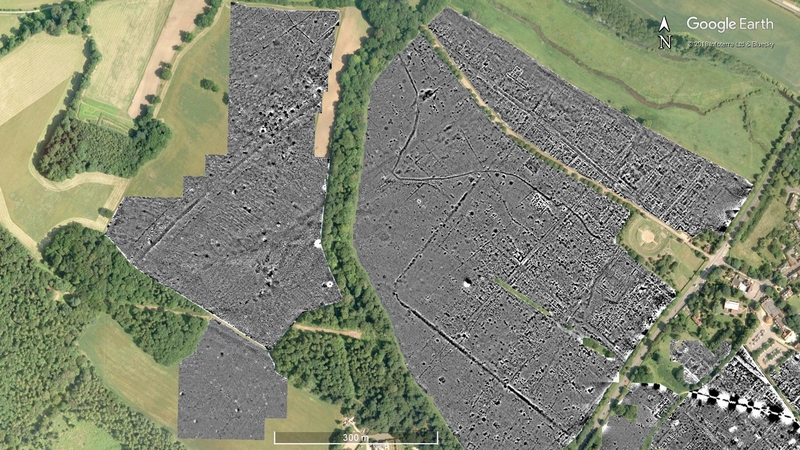 Figure 7 shows the whole of the 2018 survey (along with a big chunk of Verulamium). Figure 7: the mag survey after day 18. Even though we have been using the machine for some years now, and it does have its frustrations, when all is going well we can really cover some ground. The season was planned for 20 days: we lost 3 days to rain, and most of a day to testing the mag at the start. 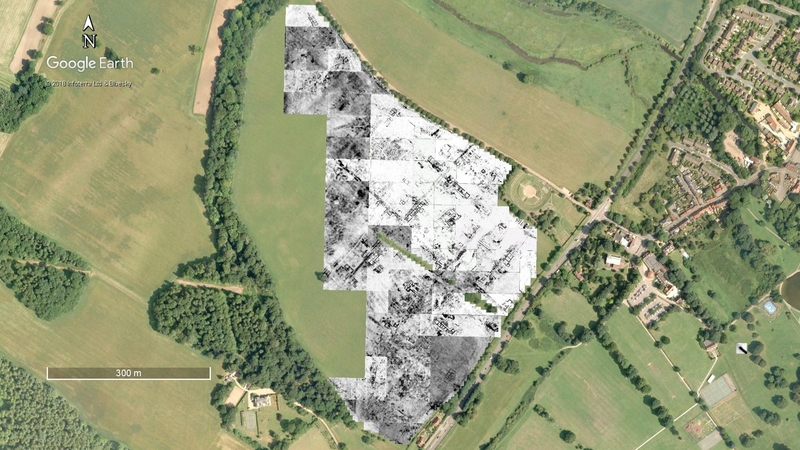 Despite this, the team have managed to collect 17.7 hectares of mag data. Without actually getting to the grids and back (which is quite a bit of walking in itself), the team have pushed the cart 88.5km over the past four weeks. Figure 8 shows the southern area in more detail. Figure 8: the southern area of mag data after day 18. The blue arrows in Figure 8 indicate the lines of old field boundaries. These can be seen on old maps such as the 1699 parish map. The yellow arrows mark ferrous objects. Some are very big, but there are a scatter of smaller ones too. Last, but definitely not least, there are a few magnetic features which may be archaeological, such as pits. I have picked a few out with red arrows. Although they look small at this scale, they are probably 1m to 2m across, a quite respectable size for a pit. 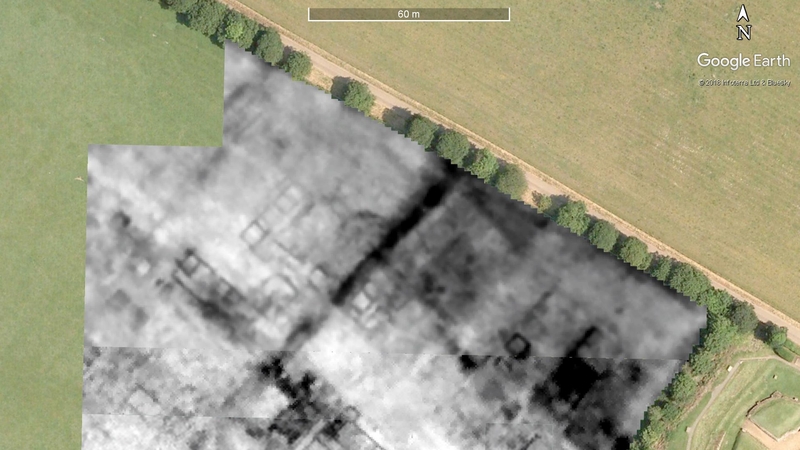 1,000m NE of the new villa found at Windridge Farm. Also, the Fosse, which is preserved in the woodland along the NE edge of the field, is a really very impressive earthwork. We just seem to have hit an empty bit of landscape between all these sites! The res survey now covers some 6.58ha, that is about 263,200 earth resistance readings. Not into the millions like the mag and GPR, but this is res after all! Figure 9 shows the entire survey. Figure 10: the entire Earth Resistance survey after day 18. At this scale the roads show very nicely as do some of the more substantial buildings. Figure 11 is the area surveyed in 2018. 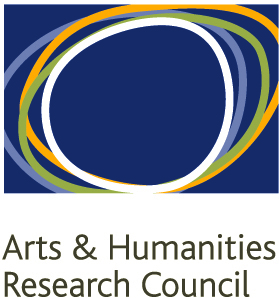 Figure 11: Res survey after day 18. 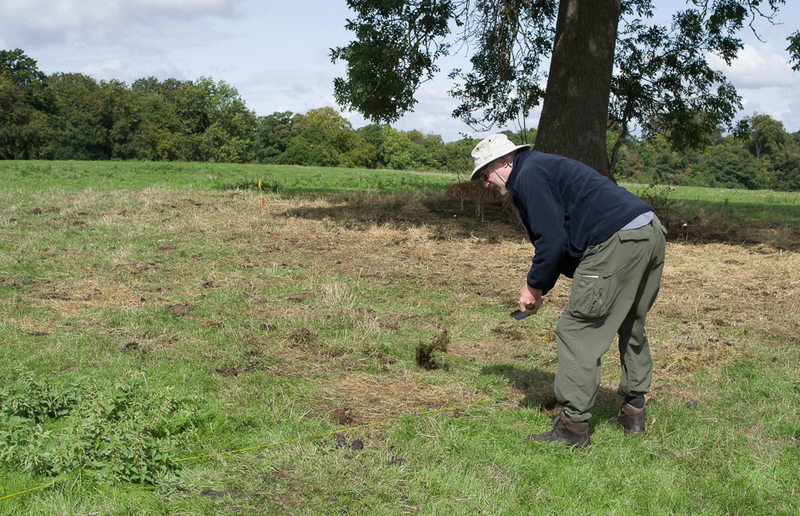 Given that the fields were baked hard and the grass was dead at the start of the season, I am pleased we managed any Earth Resistance survey at all this season. The team yesterday put-up with my geophysics OCD and completed right into the corner by the theatre. We then doubled-back and started filling-in between the top of the survey block and the drive. 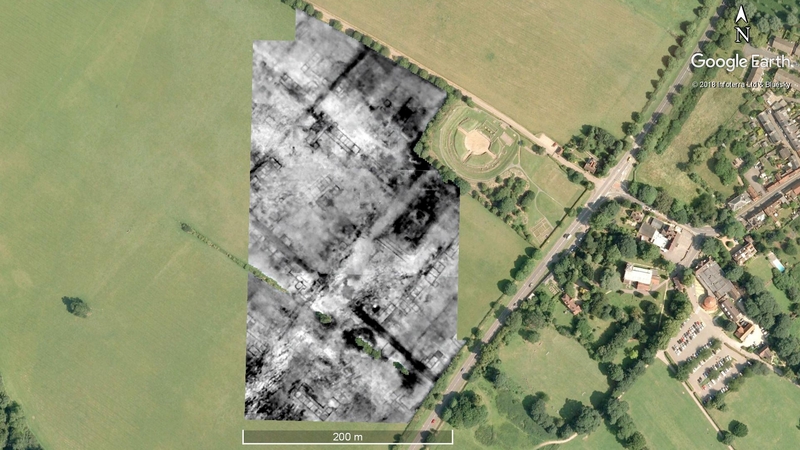 We have picked-up some parts of buildings seen in grids to the south, but in general along the edge the deep colluvium, as shown by the sunken nature of the drive, is to some extent masking the archaeology. Many thanks to everyone on the team who made the 2018 season such a success. A especially big thanks to those who helped move the equipment about including Ellen, Mike, Jim and Ruth. For those who haven’t been involved but would like to join future surveys, do get in touch. We are a friendly group, and provide on-the-job training. 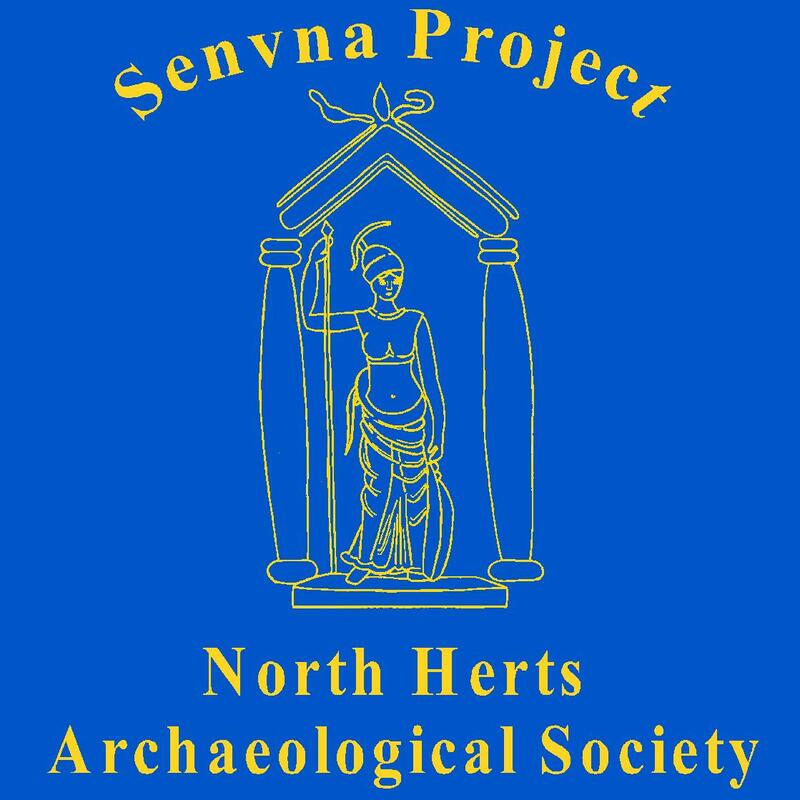 This entry was posted in Verulamium and tagged ahrc, Arts and Humanties Research Council, CAGG, community archaeology, Dolly Parton, earth resistance survey, Foerster, geophysical survey, geophysics, Geoscan, Geoscan RM85, Gorhambury, GPR, Ground Penetrating Radar, Hertfordshire, Iron Age, magnetometry, Mala, rain, resistance, Roman, Roman town, Roman urbanism, SEAHA, sheep poo, St Albans, ucl, Verulamium, WAS on August 26, 2018 by hertsgeosurvey. Interested in a site? Check here for posts.